Last week Niki Ashton, a challenger for the New Democratic Party’s federal leadership, announced that she was pregnant, and that stated that “like millions of Canadian women I will carry on my work…to build a movement for social, environmental and economic justice for all.” The response to her announcement has been largely supportive, although some have questioned whether balancing these two responsibilities is wise, and others have attacked Ashton for the particular phrasing of her announcement based on a belief that her pro-choice position had her sanitizing the reality that she was carrying a child. 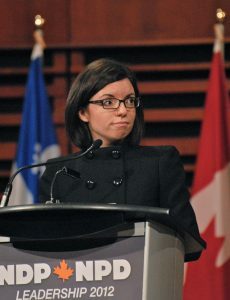 Photograph of Niki Ashton. By Asclepias – used under CC BY-SA 3.0. In many ways, Ashton’s announcement is historically significant, as there has not been a person running for the leadership of a major federal party while pregnant. But Ashton is following in the general footsteps of others. In the 1970s and 1980s, Parti Québécois cabinet minister Pauline Marois gave birth more than once, including while seeking the party leadership in 1985. Likewise, BC Premier Christy Clark was in cabinet when she gave birth in 2001, and Sheila Copps was the first federal MP to give birth while in office in 1987.Recently, pregnant legislators have become more common, due in part to young MPs and MLAs elected in the 2011 federal NDP Orange wave and in the 2015 Alberta NDP victory. Still, challenges faced by women like Marois, Copps, and Clark continue for today’s parliamentary mothers. There is no set mechanism to provide maternity leave to legislators, and balancing votes, travel, committee meetings, and constituency appointments with a young child is difficult. Additionally, the logistics around things like breastfeeding lack formal processes and accommodations. While there has been increasing acceptance of seeing babies on the floor of Parliament, rules around this are still unclear, even among the MPs themselves. The history around political motherhood is a long and interesting one, and we can learn a great deal by focusing in on two pioneering women. First is Agnes MacPhail, who became the first female MP in 1921. As Terry Crowley notes in his biography of Macphail, the media and her adversaries often pointed out her ‘spinsterhood,’ sometimes to insinuate that if she better fit gendered expectations, she would have a husband and family. These remarks stung Macphail so deeply because she actually did want children and a husband, and often felt like she sacrificed that desire in the pursuit of her career: “But [as] I love children and have always had dear men friends, it was deep a sorrow to me that I couldn’t do all I expect women to do; to be a wife and mother and also an UNTRAMMELED ACTIVE PERSON.” For Macphail, then, the realities of sexism didn’t just affect the perception of her work as a Parliamentarian, but the feeling that she couldn’t—in modern parlance—have it all. We have undoubtedly made strides forward since Nielsen and Macphail, both in terms of legislative reforms and cultural progression about what the role of women is. Still, the challenges that women in leadership positions face have not disappeared, and the physical as well as social dynamics of childrearing mean that many women must still choose between devoting themselves to both career and family in a way that most fathers don’t have to do. Niki Ashton’s announcement was celebrated by many young women as a sign that they can seek high office while pregnant, and her colleagues have increasingly shown that they won’t put either their familial or professional ambitions on hiatus. But pressure from media, anachronistic regulations, and a wider culture still resistant to women in leadership must be overcome before new heights are reached. 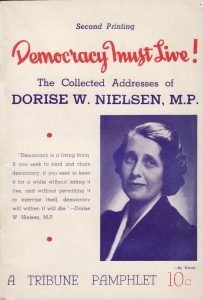 Ashton may well win the leadership, and perhaps even the keys to 24 Sussex, but her decision to continue her quest should further blaze a trail started by the immense sacrifices of women like Macphail and Nielsen. Christo Aivalis is an adjunct professor of history at Queen’s University. His dissertation examined Pierre Trudeau’s relationship with organized labour and the CCF-NDP, and is being published with UBC Press. His work has appeared in the Canadian Historical Review, Labour/le Travail, Our Times Magazine, Ricochet, and Canadian Dimension. He has also served as a contributor to the Canadian Press, Toronto Star, CTV and CBC. His current project is a biography of Canadian labour leader A.R. Mosher. A great piece with a sensitive treatment of Nielsen and Macphail. thanks!